Start-up companies continue to build and grow their companies in the Crescent City, prizing New Orleans with yet another nickname: Silicon Bayou. New Orleans keeps surprising everyone. As businesses flourish in the emerging city of NOLA, the city is starting to be recognized world-wide as the next possible big city in the tech world. Over the last few years, NOLA evolved into one of the most well-known tech hubs in the United States, and foreign countries have started to consider it as a good U.S base for their start-ups as well. Plenty of industries know NOLA has always had big potential, and the city has often hosted a variety of companies from different sectors, from energy and petroleum to agriculture. These days, young start-up companies and established tech hubs recognize the allure of the heart-pumping city. Compared to the big names like San Fran, Austin, Chicago, and the like, NOLA may seem young, but it won’t stay that way for long. With affordable living expenses, plenty of resources, and a burst of culture, it’s no wonder why the evolving city isn’t on the tech hub list. Settled in the bustling city of NOLA, Silicon Bayou attracts young start-ups by offering a city with a gateway to the world. As a city known for its rowdiness and reputation, traveling foreigners are no strangers to the city. With an airport that connects NOLA to the rest of the world, the city has long been considered an international city. Now, it is being considered an evolving, international niche for entrepreneurs. NOLA has become a nest where start-ups are evolving, big names are settling, and different languages are gathering. The world watches, listens, and communicates in NOLA. 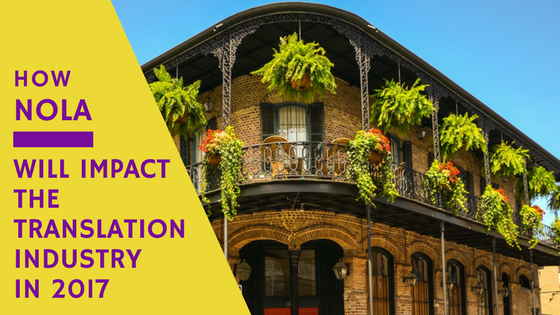 That’s where the translation industry comes into play to make a difference as a key player in the dialogue that NOLA is having with the rest of the world.